Silver Spring is an unincorporated area, City, and census-designated place (CDP) in Montgomery County, Maryland, United States. It had a population of 76,716 according to 2013 estimates by the United States Census Bureau, making it the fourth most populous place in Maryland, after Baltimore, Columbia, and Germantown. 38°59′26″N 77°1′35″W, notably some distance from the Census Bureau’s datum. 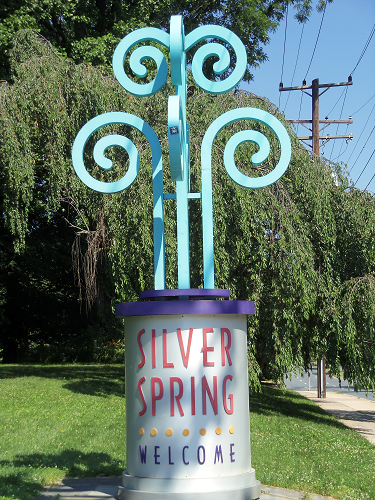 By another definition, Silver Spring is located at 39°0′15″N 77°1′8″W (39.004242, -77.019004). The definitions used by the Silver Spring Urban Planning District, the United States Postal Service, the Greater Silver Spring Chamber of Commerce, etc., are all different, each defining it for its own purposes. Residents of a large swath of South-Eastern Montgomery County have Silver Spring mailing addresses. This area extends roughly from the Washington, D.C., Prince George’s County, Maryland and Howard County, Maryland lines to the south, east and north, and Rock Creek Park and Plyers Mill Road to the west and north-west. These boundaries make Silver Spring larger in area than any city in Maryland except for Baltimore. Some notable landmarks are the world headquarters of Discovery Communications, the AFI Silver Theatre, the NOAA headquarters, the headquarters of the Seventh-day Adventist Church and the national headquarters of the Ahmadiyya Muslim Community.